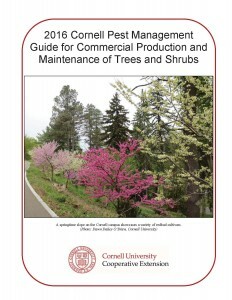 The 2016 edition of the Cornell Pest Management Guide for Commercial Production and Maintenance of Trees and Shrubs is now available. This annual publication provides up-to-date pest management information for those producing or maintaining trees and shrubs (including Christmas trees) in New York State. It has been designed as a practical guide for producers, landscapers, pesticide dealers, and others who advise those producing or maintaining trees and shrubs. Adding southern pine beetle to the insects of concern. Adding boxwood blight to diseases of concern. Identifying pesticide active ingredients meeting EPA’s criteria for acute toxicity to bees. The Cornell Guidelines are available as a print copy, online-only access, or a package that combines print and online access. The print edition of the 2016 Tree and Shrubs Guide Cost is $28 plus shipping. Online-only access is $28. A combination of print and online access costs $39.00 plus shipping costs for the printed book. Cornell Guidelines can be obtained through your local Cornell Cooperative Extension office or from the Cornell Store at Cornell University. To order from the Cornell Store, call (844) 688-7620 or order online.